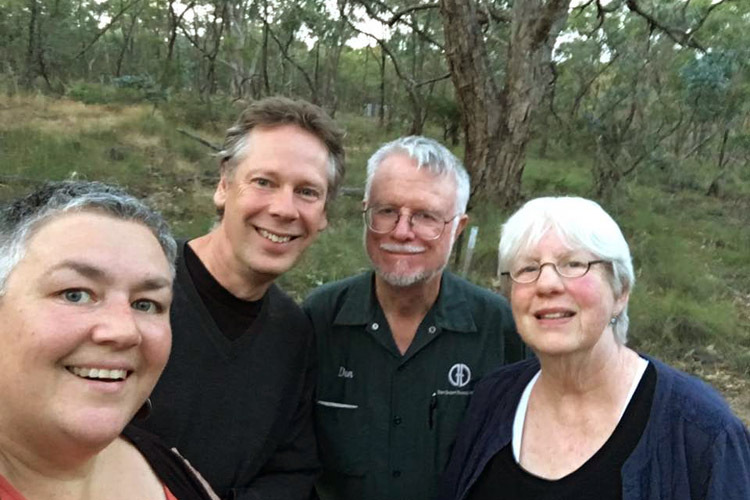 Recently, we had two nature sound friends visit us from the US; Dan Dugan and Sharon Perry of the Nature Sounds Society. 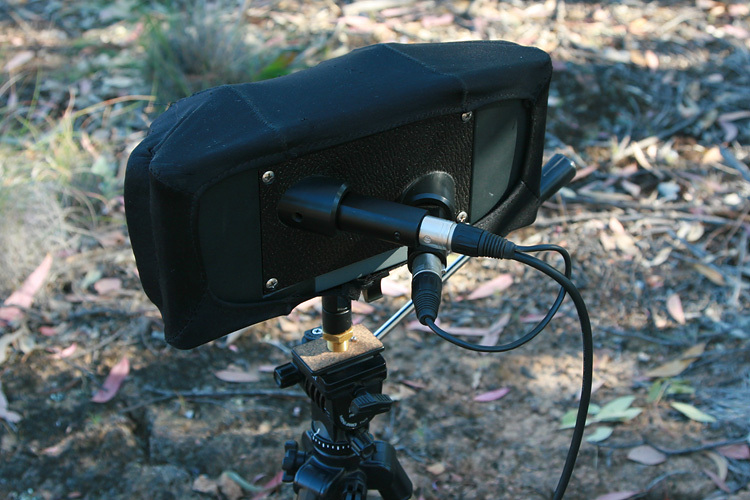 A lovely opportunity for chatting, good food, wine, a stroll in the bush, and of course recording and comparing of microphone rigs. It was their first time in Australia, hearing magpies, fairy wrens and kookaburras. Dan had with him a Zoom H2 (Oomagamma-modified – the internal mics removed and replaced by 3.5mm stereo jacks for front and rear pairs) and a quartet of Telinga clip-on microphones. I had my two preferred stereo rigs; a SASS and PIBO. It is always a pleasure to speak before a curious audience about soundscapes, nature and birdsong. 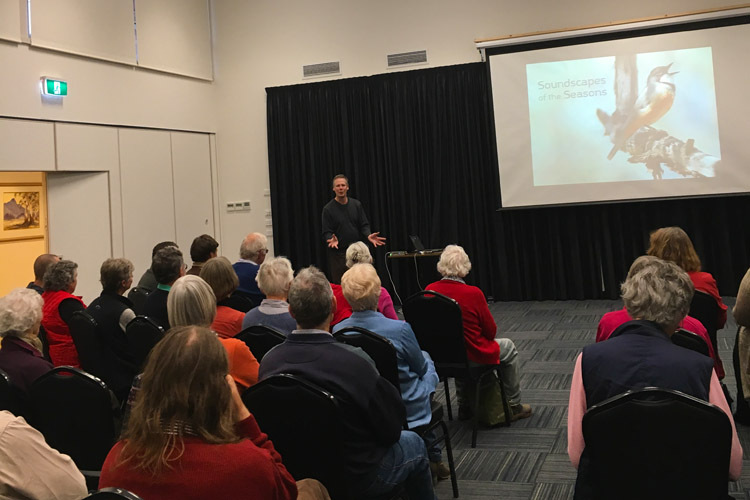 Last Friday I was invited to talk in Dunkeld by the local Landcare group, and premiered my a presentation: ‘Soundscapes through the Seasons’, showing how our local natural soundscapes change over the course of the year. After all the rain we’ve had this season, the wetlands around Dunkeld were full and the frogs in riotous voice. Before the evening talk, Lisa McIntyre from Landcare took me on a ‘swamp crawl’ around the district. At Freshwater Lake we got this lovely recording of growling grass frogs (very appropriately growling among long grasses), along with pobblebonks and crinias. Can I purchase Listening Earth albums on CD? Every now and then we get an enquiry asking this question. The quick answer is: some of our albums are in print on CD, but many are not. Here’s why, and what the options are. Sound in nature often comes from every direction. It usually encompasses a 360º horizon of distant sounds, to which can be added closer sources above; birds in flight or calling in the tree canopy overhead. So it can be conceived of simplistically as a dome of sound, only in certain circumstances presenting anything from the ground below. Turning this into a left-right stereo field for a soundscape recording is not as straightforward as it may seem, and many rigs have been tried and championed by various recordists. The one I’ve been using over the last decade is a Crown SASS, modified to hold a pair of Sennheiser MKH20 omni-directional microphones. It does a pretty spectacular job, yet recently I’ve been curious to explore a different approach. When we visited Nagarhole in 2002, we faced considerable difficulties in making any sound recordings at all. Firstly, we had to seek permissions from the Chief Wildlife Warden of Karnataka State in Bangalore, necessitating a week-long journey to obtain the required documents. Nagarahole is a Project Tiger reserve, and access to the forest was restricted by curfews. We also had to request special dispensation to enter the park in the early hours to capture the special sounds of predawn. On one occasion we were allowed to remain after dark. We were required to stay near our vehicle, with the constant attendance of a local village guide, who always seemed to be smoking and coughing up the residue. All our recordings are made in pristine habitats, and occasionally we encounter rare or threatened critters. We had the privilege of hearing and recording the calls of a pair of Sooty Owls (Tyto tenebricosa). This clip is from our first album ‘Tall Forest‘ – and was recorded in late summer in the mountain Ash forests of eastern Victoria, Australia. 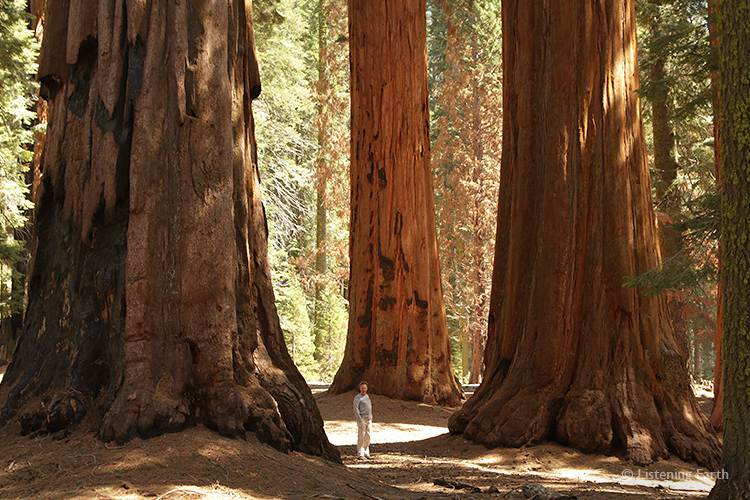 North America ticks all the boxes when it comes to trees – they have the tallest, oldest and biggest! The Coastal Redwood, the tallest living thing on earth towers skywards (110+ metres) leaving you feeling ant-like, among the ferns. The Bristlecone Pine, the oldest living thing on earth, approx 5000 years old, endures a harsh climate of altitude, wind and snow. Then there is the Giant Sequoia, which can grow as wide 50 meters around and reach up to 90 metres. They are gigantic and monumental in presence – and how their ‘cinnamon’ bark glows in the afternoon light. 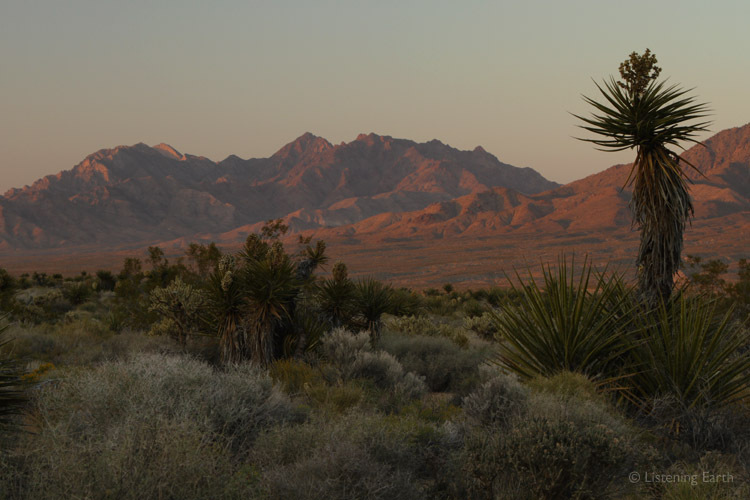 Traveling to the Mojave Desert was a pilgrimage of sorts for me. I am a desert lover and the idea of camping out under a desert sky and sleeping under Joshua trees had been living in my imagination for years, actually, decades. I can’t remember the first time I heard about Joshua Trees and the Mojave Desert, but I do know that the combination of these mythical trees and starry nights resonated deeply in my imaginings. Have you ever done internet dating? We haven’t, but sometimes it felt as if we were; setting forth across north America for three months to meet some of our nature sound recording colleagues. When we describe birdsong as ‘nature’s music’, we often mean it more poetically than technically. The reason I think is that our music is based around scales and melodies – that is what we think of as musical. When we hear a bird singing ‘musically’, it is usually a species who’s singing is in a recognisable scale – Australia’s Pied Butcherbirds or India’s Malabar Whistling Thrushes come to mind. But these species are soloists. 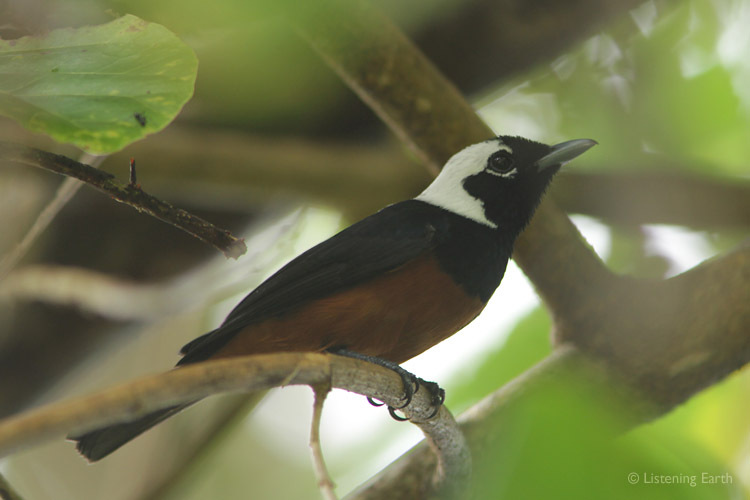 In the Solomon Islands, for the first time, we encountered a community of birds singing in a musical scale.